Easter is a time of celebration, family gatherings, egg hunts, chocolate candies and pretty baskets. Lots of shiny plastic eggs and pretty flowers in center pieces to make the house festive for company. We put together this post to help you keep your pet safe during the Easter/Spring time season. 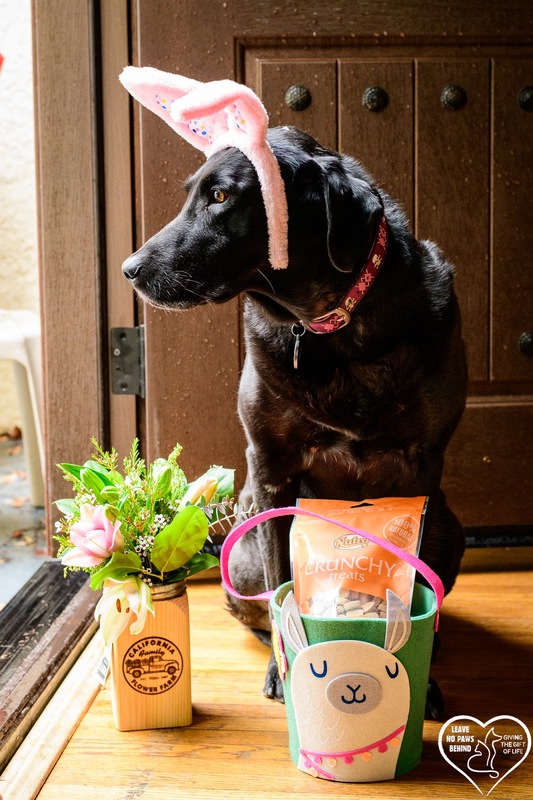 Easter basket are a common way to celebrate the season. 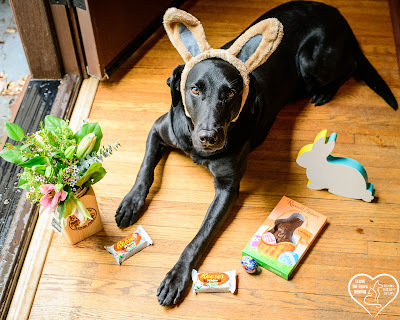 One of the main treats in Easter baskets is chocolate. Chocolate is toxic to pets, so please keep candy packages, Easter baskets, and plastic eggs filled with chocolates away from pets. Make sure if you are hiding plastic eggs with chocolate inside in an area that a pet has access to, that the eggs are found and put away so the animal doesn't find it later. 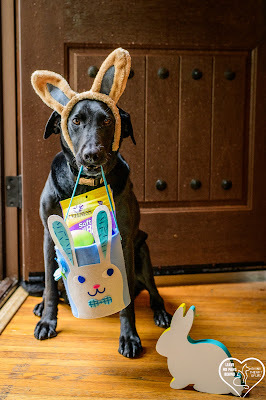 Keep all chocolate out of reach of pets. Fillers used inside Easter baskets, like fake plastic grass, can prove enticing to your dog or cat. If ingested, it can get caught in their digestive system and cause a blockage or damage to their intestinal tract. If that happens, surgery may be required to remove the obstruction. Candies that contain xylitol, a sweetener often found in sugar free products, can cause a release of insulin that leads to a fast and extreme drop in blood sugar. That can lead to liver failure and/or death. Xylitol ingestion should be considered an emergency. Easter lilies are very popular this time of year. Every part of the lily is toxic to cats and can cause vomiting, appetite loss, dehydration, lethargy, staggering, disorientation, seizures and could lead to kidney failure and death. The is no medication to counteract the toxins if ingested, so an immediate trip to the vet may be required if your cat licks or eats lilies. Table scraps and fatty people foods like ham can prove to be very rich to a pets system, and can lead to pancreatitis. Foods with bones, like chicken or turkey, can pose a choking hazard. Other foods, like onions, garlic, and grapes are toxic to pets and should be kept out of reach. Make sure that guests don't leave unattended plates of food around the house, and keep an eye on pets while preparing food in the kitchen. Alcohol is dangerous for animals. Due to their smaller size, alcohol hits their blood stream very quickly and can cause lethargy, vomiting, and disorientation. Don't leave glasses unattended. Springtime leads to warmer weather and new growth in the yard. If you are doing yard work that includes spreading herbicides, fertilizers, or insecticides, read all instructions and warnings and make sure your pet remains indoors during the application. The pet shouldn't be allowed back outside until the application is dry. Many of the yard sprays are pet safe when used properly, but use caution with items like snail deterrents that can be eaten. Warmer spring weather also means open windows. Make sure all window screens are on tightly to prevent your pet from escaping. In case of an emergency, make sure you have your vet's phone number, the closest animal ER (in case your regular vet office is closed) and this ASPCA Poison Control Hotline available. The ASPCA link also includes a more thorough listing of dangerous food, plants, and household items. 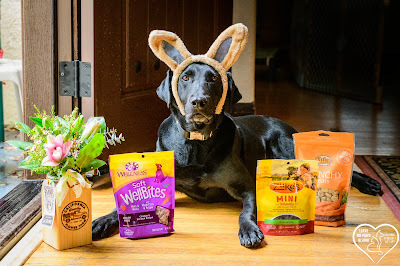 If you are looking to put together a basket for your pet, your local pet store has a lot of Easter/spring themed items to help you put together a great treat basket. 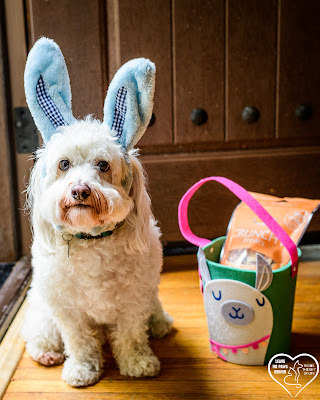 Stuffed bunny squeaker toys, treats made with carrots, pastel colored collars and leashes are all available this time of year. A few of our favorite snacks, from companies like Zuke's, Wellness, and Nutro are shown in the picture above. They can make great rewards for training and bonding with your dog! Whether you have a cat, dog, or even a bunny, make sure you keep them safe and out of harm's way. 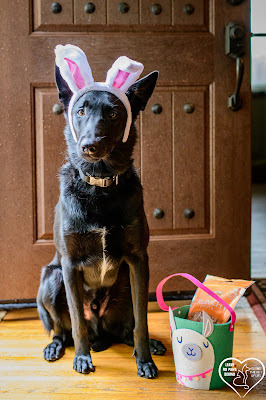 While this post is about Easter dangers for pets, a lot of these items can be found around the house all year round. We hope you found this post informative, and if so, please don't hesitate to share it on your social media outlets. 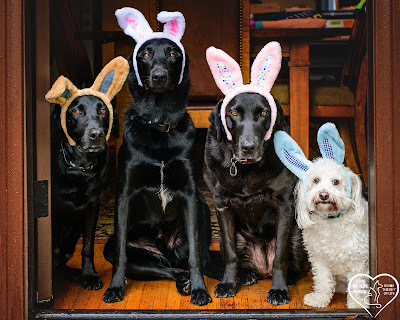 Here is hoping you have a wonderful Easter from all of us at Leave No Paws Behind!